The first assignment for my Cree 100 class is to respond to the Ted Talk given by April Charlo on Indigenous Language Revitalization. Language is a powerful tool that is a component to the foundation of all cultures. The way we use this language is also very powerful. Language helps us communicate and it helps to pass on knowledge. Taking Cree this semester has been very important to me for numerous reasons. The first reason is that I am a teacher, and as Charlo mentions in her Ted Talk, it is important to revitalize the language so that this knowledge does not become lost to us. The second reason is that my ancestors spoke Cree, and this is a knowledge that has been lost in my family. My aim this semester is to regain some of this knowledge so I may pass it on to my students and family. Since Aboriginal Traditions put great focus on Oral Tradition, it is obvious that the language holds much more than just literal translation. Last semester I took INDG 228 which was a class on Reconciliation and Indigenous Resurgence in Canada. Through this class I was able to listen to Willie Ermine speak on education and the Cree language. He spoke of how the language was sacred, and that there was knowledge embedded in it. When looking at learning Cree I have kept this in mind. Resurgence and revitalization of Indigenous language is one step that can begin to repair the broken relationships we have in our country. Whenever we discuss broken relationships, immediately I begin thinking of Treaties. Everything in our society today goes back to the Treaties, and the promises that are not kept within them. When talking about the importance of language, it is easy to make connections to the Treaties. When the Treaties were created and signed, issues were much greater than just a language gap. In the Ted Talk she speaks about how First Nations traditions did not have a concept of ownership, which in turn affects how we can use the language. It is difficult to understand, then, how Treaties could have been fully understood by both parties at the time of signing. Of course, Treaties are not the first time in Canada that land was now “owned”. The idea of ownership was introduced early with the Doctrine of Discovery, but couldn’t even be comprehended by the First Nations people. Charlo speaks about how she learned that you cannot own things that are from nature. In order to understand Indigenous languages you also must understand the culture. You can’t merely translate words, because the meaning and knowledge that goes with those words might become lost. When listening to Willie Ermine speak, he discussed how there are knowledge bundles that encompass all things and how they relate to the world around them. There is a deeper richness to the words then, as they become more descriptive. I am very excited to begin my journey learning Cree. Revitalization of languages, and in turn commitment to learning and understanding the First Nations culture, is an important step in Reconciliation. It is important that we begin teaching and learning these languages in the education system as it has been mandated to be done so by the Truth and Reconciliation Commission Calls to Action. 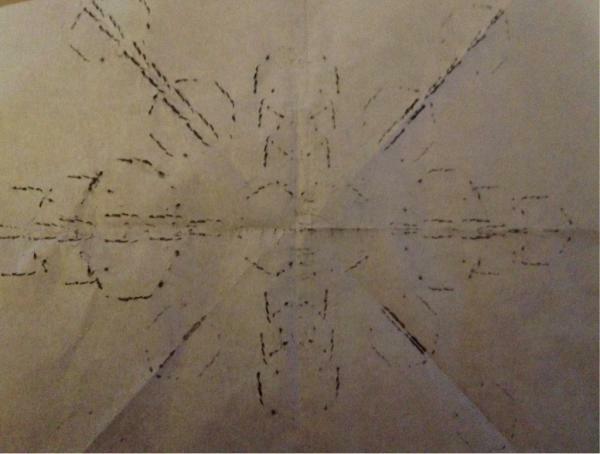 To make this you need only three things: a piece of tracing paper, a piece of carbon paper, and your teeth! To do this you take a piece of tracing paper (which you can buy from walmart in a package for under $5) and place the carbon paper directly on top of it with the black of the carbon touching the tracing paper (I got carbon paper at staples, also inexpensive) Then you make different folds in the paper to come up with different designs. What was nice for the students was that the carbon paper could be reused many times, so many kept it and tried it for themselves later. This is not the classic birch bark biting, done on actual birch bark, but is a similar process and much more convenient to do in a classroom setting. We discussed symmetry and how we could make different shapes. The students had a lot of fun trying different designs and trying to make shapes form. This could be easily adapted for numerous Shape and Space units in the math curriculum across a few grades. This is a lesson that has been done by some peers at the university on the Aboriginal Perspectives website. Along with the other workshops done, and the dancers and performers that came to the school in Moose Jaw for National Aboriginal Day, I had a wonderful day, as did hundreds of students in Holy Trinity. The second great experience I have experienced this summer came from doing another math workshop. I was asked to put on a workshop for the First Nations University for their student conference Discovering your Directions. This event had grade nine First Nation students from local schools and school divisions. There were many great activities, and I was to lead the education and math workshop. For the workshop I focused not only on an interactive math activity, but also speaking about my own education experience as well as the education program at the university of Regina. When the group came in I could tell they were not very excited that they had to “go to the stupid math” activity. I totally understood, everyone is aware that most people don’t have the most positive attitude towards math. I chose to do die hard math, an activity I have done with Math on the Move before, because it was interactive and exciting. As soon as I started the clip I had them hooked and they had a much better attitude. They finished these quickly so I started my second game, the math alphabet. For this activity I put the alphabet on the board and an integer beneath it. I then put a sum on the board and they had to come up with a word that added up to that sum. This got even more of the students involved as they started competing for the longest word, or who could make the best sentence. Finally I ended with my new favourite puzzle, the rebus. I put 20 puzzles on the board and they were very competitive finding them out to see who could answer the most. The most rewarding part of the conference was when a student asked if I was a real teacher, and if that’s what my math classes were always like, because they have never had a math class like that before. I laughed and was relieved that I could make math interesting for them. The last part of the conference that I participated in was a student panel. Myself, along with four other university students in different areas, were asked questions about school and university. I answered questions like what my favourite subject and classes were, what my biggest struggles have been, what high school classes are important, and how my culture has affected my university experience. This was a wonderful opportunity to share things that I have learned over that past years with many young and eager minds. I am so grateful and fortunate to have been apart of such a beneficial program for youth in our province, and would be eager to do so again. The last couple of days have been full of information. Our pre-internship semester begins with the (E)Merging Professionalism Conference and has got me thinking. With all of the information I have given though, the thing that has stuck in my head the most is mainly about my heritage. I was fortunate to hear talks about Anti-Oppressive Education, Treaty Education from the Office of Treaty commissioner which included a talk from an Elder from my own band, a talk about learning Treaties for Social Justice, and a talk from the keynote speaker Perry Bellegarde. Finishing just an hour before this there are some thoughts that are stuck in my mind. Rather than describe all of the wonderful things that I learned in the last two days, I want to reflect on what it has led me to think about. One of the things that I heard from the Elder talk was that Canada is the only place that has an Act to define a person. Rather than have someone define who I am, I want to define myself. Obviously I would never be able to define myself as an entire person, so I am going to focus specifically on myself as a First Nations Person. Describing this aspect of my life is always something I have difficulty with, because I feel like I don’t know enough and I’m ashamed of that. My First Nations background isn’t something that is apparent in my every day life, but rather something that is part of my underlying structure; it makes me who I am. In order to define myself I really have to define my family. Two of the people who have most shaped me in my life are my mother and my grandfather. I have learned in my family that we often do not talk about many things concerning our First Nations background, and therefore I find that I don’t also. I have also learned that when I am given information I should be very grateful of it, and listen and retain as much information as possible. My grandfather went to a residential school, and up until the last couple of years that was the only thing I knew about it. Through my mother I have learned that the choice to go to the residential school, along with the numerous other brothers and sisters in my grandpa’s family, was made by my great-grandmother and she considered it to be a good thing. Life on the reserve was not good and it was better for her children to send them to a residential school. My family chose to go along with assimilation, knowing full well of the repercussions, and with that great sacrifice came many expectations. My family gave up our own culture to survive, and this survival is focused mainly on education. Education is an extremely important thing in my family. Getting a job, and working hard for everything you get, is how I was raised. Because of this fact a majority of my family, on my grandpa’s side, have gone to some form of post secondary. Another thing that is important is that nothing is taken for granted. The fact that we are given this education needs to be used to our best ability. I understand that my grandfather has gone through a lot through his life, and has been constantly oppressed. Because of this I know that he works hard in a sense that he doesn’t want to give anybody a reason to mold him into any stereotypes. My grandpa is well into his seventies and he just retired at Christmas… for the second time in his life. He continues to work hard because it is what he knows. I know that he wants to continue working hard because he doesn’t want his children and grandchildren to go through anything he has. This Christmas I was fortunate enough to get stories from my grandpa. I asked if he would teach me how to make Indian Donuts and Bullets, traditional food that our family makes around new years. New Years Eve i spent a majority of my day making fried dough and meatballs with my grandpa and it was one of my favourite memories of 2010. He told me stories of previous times making the food, passed the recipes down to me, and told me lots of stories of my family. He said I would make a good little Indian woman and that I was the family Indian Donut maker. I wouldn’t trade that day for anything. Although these things don’t seem to really define much about me, they do hold great importance to me. The most important thing is that I understand that I don’t know very much about my heritage. I’m Cree and I only know one word, although my grandpa did lose the language when he went to the residential school. I want to learn more about myself and my family, and I want to do things to make my entire family proud. Because education was so important to my family it has become the most important thing in my life. My definition is quite short, but i will forever be building on it.